A natural realistic looking Small Hide Rock that enables animals to retreat in an enclosure. This hide rock will also help animals get closer to the heat source for basking. SMALL Size = L 210 x W 160 x H 100mm. Ultimate Hide Rocks provide reptiles with a secure hiding space while adding to the décor of the enclosure, with a natural rock appearance.All reptiles need a hiding space to prevent stress related diseases and also give the reptile a place to rest, digest food and sleep. Ultimate Hide rocks are a solid construction that stays in place and is also easy to clean which helps hinder the growth of bacteria. 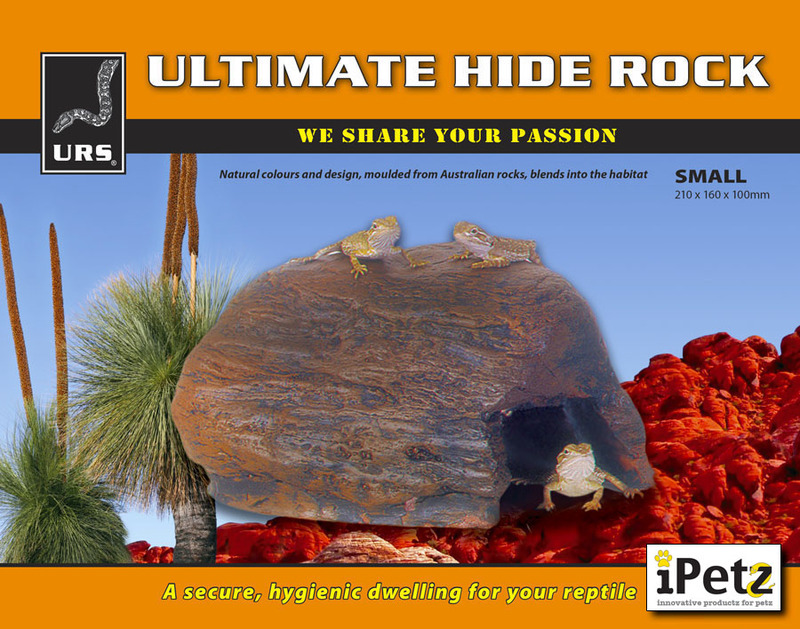 The hides are available in 4 sizes to suit all types of reptiles.Ultimate Hide Rocks are handmade so colours will vary with each rock.Ultimate Hide Rocks are the first product of many that are solely owned and produced by Ultimate Reptile Suppliers Pty. Ltd.